This beautiful crispy pizza was made on the stove top! If you’re sitting there shaking your head then I don’t blame you at all. When Bessemer (an Australian cookware manufacturer) contacted me about trying this out I was completely convinced that it would not work. I watched the Bessemer pizza promotional video on youtube and couldn’t believe my eyes. There was just no way you could cook a pizza in a pan on the stove top and have it turn out halfway decent, right? Wrong! Now, before I tell you exactly how to do it with step by step instructions I want to preface it by saying one thing. If you’re after a proper, authentic wood-fired pizza then that’s not what you’re going to get. However, if you’d like to make your family pizza from scratch and kiss goodbye to overly salty and fatty frozen pizzas, then this is the cookware for you. Added bonus: You make the whole thing, including the dough, in the one dish so there’s no messy flour to clean up! Bang the flour, spices and oil into the dish. 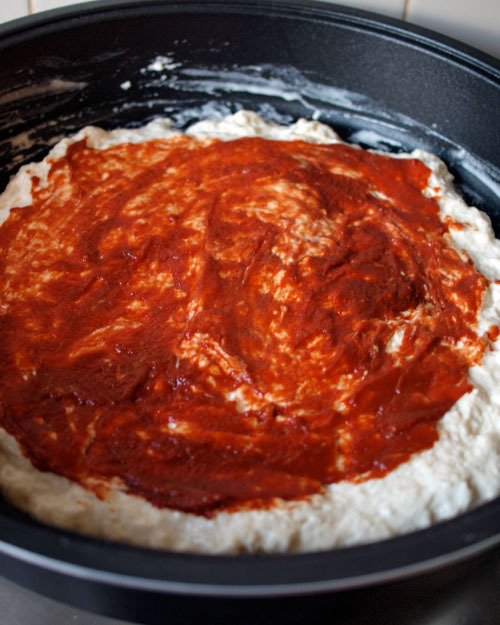 Spread out the dough into a pizza shape. Cook and voila! Home-made pizza in less than half an hour. 2) A nice clean pan! That’s right, you just wipe the pan clean with a soft cloth and put it away. No burnt cheese stuck to your oven racks and walls! The secret to this piece of cookware is the tri-titanium coating and the special air vent on the lid to help steam escape and bake like a traditional oven. It’s like having a mini oven on your stove top – and it doesn’t heat up the house! Christie received the Bessemer 34cm Baking Dish and Lid to trial courtesy of Bessemer and Wilkinson PR. I’ve adapted the original Bessemer recipe. Click this link to see the original. 1. Add the flour, salt, pepper, oregano and oil to the Bessemer 34cm baking dish base. Add the cup of warm water and mix with a plastic spatula (you don’t want to scratch the lovely non-stick surface). It will seem like it’s not going to come together, but just keep mixing. 2. Spread the dough mixture out with the spatula into a round shape. It might not reach the edges at this stage, but that’s OK. Let it stand for about 5 minutes and it will slowly spread (thanks to the raising agents in the flour). Then use the spatula (or slightly damp hands) to press and push out the dough to almost reach the edges of the pan, making sure the dough is even. See third picture above. 3. Place the baking dish onto the stove top and turn the heat to medium. Spread tomato paste over top of dough base and sprinkle with a bit of the cheese. Arrange all the other ingredients on top and finish with the rest of the cheese. 4. Place the lid on the dish and cook with the vent open for 5 minutes on medium heat and then 5 minutes on low heat. Important Note! My stove top is notoriously bad with heating up properly, if yours is too then follow these instructions. 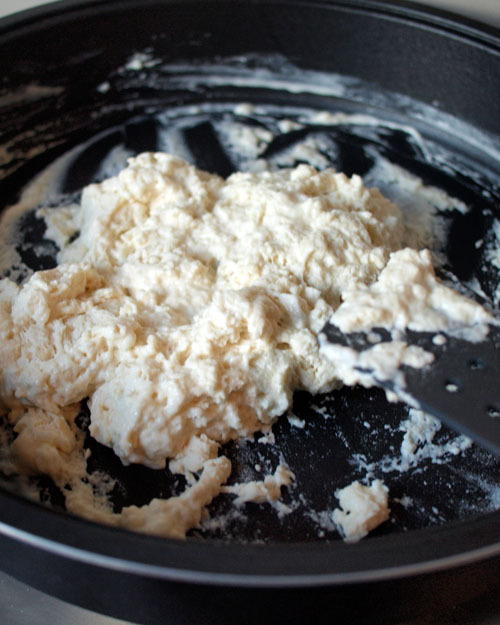 If after the first 5 minutes on medium the dough appears to still be raw, continue cooking for another 5-10 minutes on medium or until the base becomes crisp (check at 3 minute intervals). Once the base is crisp, turn the heat down to low and cook for 5 more minutes. 5. Slide out onto a platter and serve hot. ← I’m celebrating Easter with cupcakes. What the hell? Stove top pizza? My only concern – how successful was the transfer from the pan to where you slice it? Hi Fiona – Super easy, actually! It literally just slid out of the pan and onto my wooden chopping board. It’s truly amazing! That is so cool Christie! I can’t wait to check it out! I may have to wait till Lebanon ’cause here I have an electric stovetop can’t get gas in this darn neighborhood! so it probably won’t work as well pizza looks luscious dear! No washing up? That sounds like my kind of pan! I like the idea of no washing up, but really love the kneading of pizza dough. Wow Christine this is amazing! My partner doesn’t have an oven (but has a stove) so this would be absolutely perfect for cooking pizza at his place. I’m not at all surprised it works. I bake small batches of bread on the stove regularly. With a product like the Bessamer stove stop oven device thingie, I bet it could do a regular batch of buns on the stove, too. Using a gas stove, I’ve learned it’s important to have an air gap between the bottom of the “oven” enclosure and the baking pan, otherwise the bread burns in the same pattern as the flame. I take it the Bessamer product, at least with an electric stove, doesn’t have that problem. I’d be curious to hear if it works as well with gas. Interesting stuff! I lament not getting back to them to try it out but I think I was about to go away. It looks really easy too. I’m thinking bachelor cooking recipe? I was not convinced by the Youtube vids either but this actually works. Def a bachelor’s recipe! I cook pizza on our Bessemer pan all the time. It’s great. Your pizza looks yummy. Homemade pizza in half an hour ……I have to be impressed!!! Looks as good as take out, if not better!! I wish they had contacted me! I love their stuff…in fact my mother gave me her 2 precious pots that are over 20 years old! Sour grapes aside…ahem…this looks great. 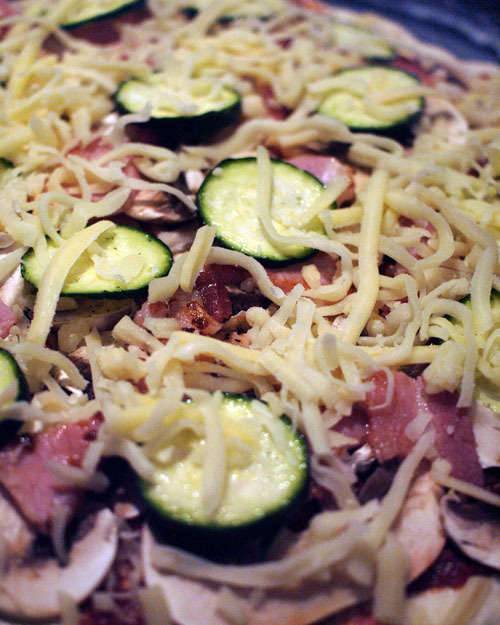 The stovetop pizza method looks amazing—thank you for sharing Ms Christie! I had to re-read to see if I was missing something. Cooking a pizza on top of the stove?? I’ve never heard of that before. Thanks for enlightening me Christine! The crust looks soooo yummy. I’m tempted to get pizza for lunch but I should be good. I like your combo of toppings, but ham and pineapple is still my fave! :) That’s one neat pan! One dish cooking that really only uses dish pan! I like it :) Heat coming from the bottom would keep the base really crispy. Does it come with a lid? What a neat gadget! I’d love to see what else it can do. What about crepes? Cakes? Hi Laurie – Sorry I’m late in answering your question… I wanted to double-check with Bessemer, The answer is yes you can absolutely use this cookware on a gas stove! Hmm…I was given one of these pots as a present a few years ago but must say I hardly ever use it. It seems to draw a lot of moisture out of anything I cook in it and I end up with a watery mess. I am not a huge fan of cooking in aluminium and non stick either. I should try this pizza recipe though before I actually ditch the pot. Hi Spice and More, Oh no! I think your issue has to do with the special lid. When you leave the vent closed it keep moisture in the pot (great for stews etc). If you want moisture removed then you leave the vent open so steam can escape and crisp up the contents – which is what you do for this pizza. I hope you give this recipe a try – let me know how you go! I jazz their stuff…in fact my parent gave me her 2 treasured pots that are over 20 age old! Subacid grapes aside…ahem…this looks major………. ok, I really want pizza right now – this looks amazing, and the pizza looks seriously tasty too. pizza from scratch in half and hour with almost no washing up = awesome. thx for the recipe Christie & instructions. I have a heap of bessemmer and love all of them to death :-D… i’m going to cook this for our toddlers tomorrow night. I have a question though, if I make the crust thicker or double to recipe, will the base still work and how much cooking time will I need to increase it by? Can you use yeast based dough also or is the flour one in this recipe only recommended?? Thanks, Look forward to your reply. Thanks for the reply. Well I made the pizza tonight using 2 cups SR flour, 1 1/4 cup water, and 1 1/2 soupspoon olive oil. 2 cups SR flour turned out a bit ‘dampery’ in places to be honest otherwise it all cooked fine throughout. I think next time I will use 1 1/2 cups SR Flour and see how that goes (as original recipe). Cooking time I increased by 5 minutes only on each of the settings and let it all brown up while in the pan under the grill until the cheese went slightly brown. I don’t have the 34cm dutch oven but instead have the black one with the glass lid (not sure what it’s called mum gave me a swag when she did bessemer sales) that one I just removed the knob from the glass which allowed for a larger “vent” area that otherwise the traditional ones have and it worked a charm. The proof in the pizza so to speak was that our 4 year old, almost 3 year old and 18 month old loved it all. Topping that I used was: motzarella/paremesan cheese. red capsicum cut into 5mm cubes, 1 rasher shoulder bacon cut into 2mm wide strips, 1 small onion cut in 1/2 then into 2mm strips. Zucchini rounds cut into 2mm thickness rounds. I probably used about 5cm’s in length of a zucchini. I mixed that all together and cooked on a low heat in the pan w/ some olive oil and a tablespoon of sundried tomato pesto and that was my topping (kid friendly sized topping). The base was covered in tomato paste w/ mixed herbs. Once all assembled the motzarella/parmesan cheese mix went on top. I think i’ll also put the mixed herbs/seasoning through while mixing the dough initially – that may add some flavour. Obviously i’m cooking for x3 under 4 years and with our littlest one (4 months) next year need to find a cost/time effective way to cook the odd treat for the 4 of them and this does it just fine LOL! I’m also going to try making my own dough with yeast and do all of that in the bessemer dish also. Worst case if that dough doesn’t work out I can always add some extra water and use that as glue for some papermache with the kids hahah!!. ps, will let you know how I go w/ the yeast dough also. Thanks for letting me know how you went! The pizza sounds delicious and I’m glad your little ones enjoyed it too. You’re right, it’s much cheaper to make your own and healthier as well! 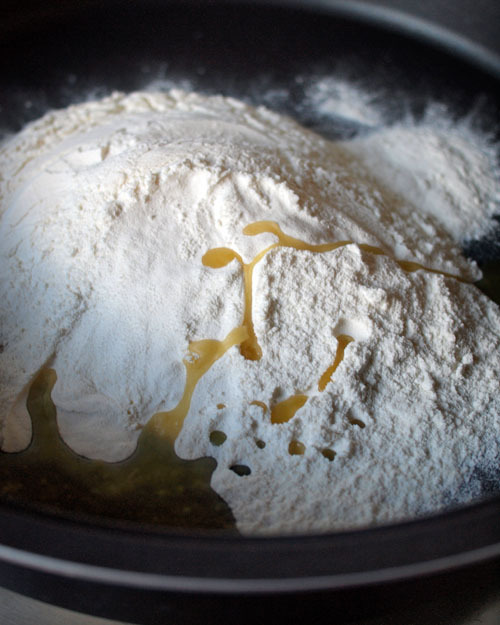 Looking forward to hearing how you go with the yeast dough. I have added herbs to the dough before and it tastes really good. Hi Christie, I love the creativity that the Bessemer stove top pizza provides. Why pay for take out when you can make your own pizza and create your own half and half if one person wants a meat lovers pizza and the other person wants a veggie pizza? You can please both people at once! I’m impressed with the Bessemer pizza. 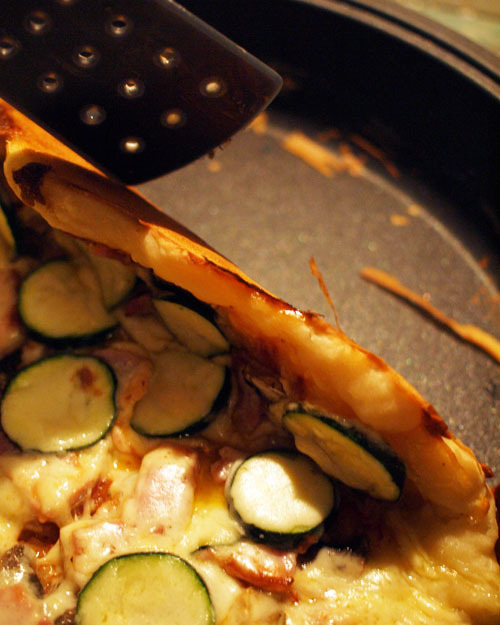 I have bessemer fry pan and Dutch oven and remember this being demonstrated to me 20yrs ago – the Pizza tasted delish. I mislaid the recipe and in the mean time have done an up grade on the kitchen the stove top – now an induction stove top had to change all the pots over to s/Steel. I have passed my bessemer frying pan over to my daughter for her to use and will give her the pizza recipe to try out. I used make this pizza many years ago. However I’ve changed my stove to induction. Is there any chance I can still make this in the oven ,as i still have my ducth oven with lid.